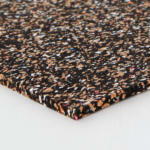 Regupol® 4515 Multi is a tough resilient acoustic underlay manufactured from PUR Foam and cork granules and is ideally suited to all new build types. Regupol® 4515 Multi acoustic underlay is compatible with all types of floor finishes including; ceramic tiles, sheet vinyl, vinyl tiles, wood and laminates, carpet and marmoleum/linoleum. The product should be glued to the concrete or ply substrate which itself should be flat and smooth with no bumps or lumps.